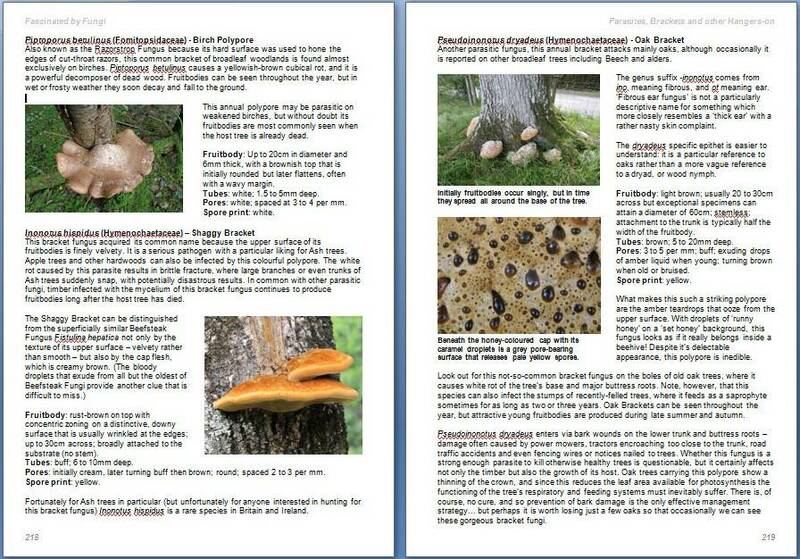 Order an author-signed hardback copy of Fascinated by Fungi online here at a substantial discount on the RRP. This is a time-limited offer on this bestselling 450-page beautifully illustrated hardback book with more than 1000 colour pictures. 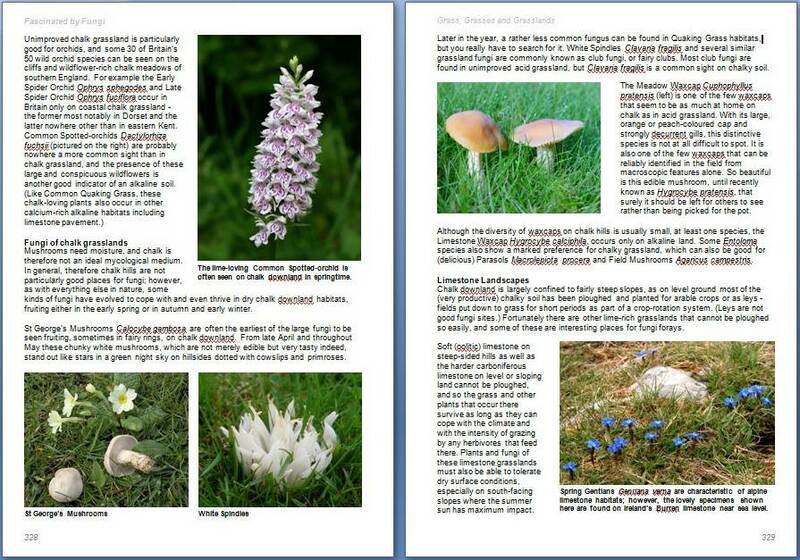 Bang up-to-date, this new edition incorporates recent taxonomic name changes resulting from recent DNA analysis, together with previously common synonyms and the British Mycological Society's recommended English names of fungi species. For millennia the mysterious nature of fungi has intrigued the intrepid. Fungal fruits of field and forest have fed the fearless, while the (surprisingly few) resulting fatalities have fuelled myths and legends. 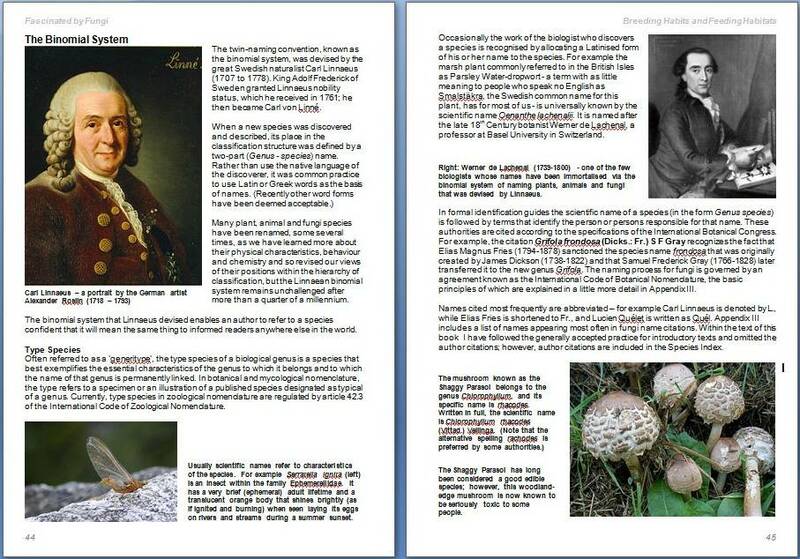 Monks and murderers have turned mushrooms to their advantage; artists and authors have fallen for the fascination of fungi. Once enticed in to this quirky kingdom, the magical mix of majesty and mystery has enough power to captivate the interest for a lifetime. But the complexity and scientific jargon of the subject made it difficult for newcomers to gain a broad view of this vast topic... Problem solved! 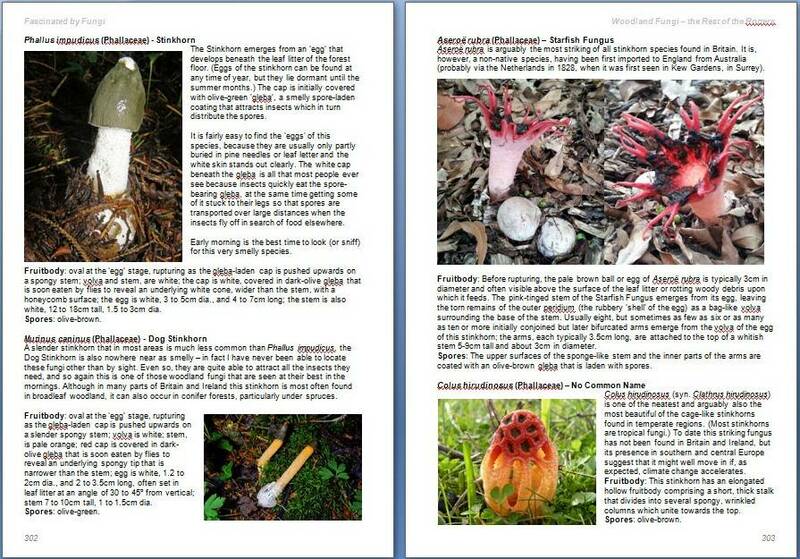 Fascinated by Fungi is an easy-to-follow introduction to a complex and largely unexplored kingdom of life and the history, mystery, facts and fiction born out of the fascinating foibles of mushrooms, toadstools and other fungi. SPECIAL OFFER: £24-95 + £2-80 P&P author-signed copies (A SAVING OF over £3-00 on the RRP £28-00 + P&P). Pay with your Credit Card, Debit Card or PayPal Account, all accepted via the secure on-line PayPal system. You do not need a PayPal account to pay using your credit or debit card. Once you click "Buy Now" you will be redirected to PayPal for payment with a Check Out by PayPal option (orange button) and below it a further Check Out option (white button) to pay with a Credit Card or Debit Card if you do not have a PayPal account. For a single P&P charge of just £2-95 per order, books are sent by standard parcel post (usually 2 to 3 working days to reach UK addresses). Air Mail Post and Packing charge to European Countries is £9-60 - single copy orders only. Air Mail Post and Packing charge to destinations outside Europe is £14 - single copy orders only. Note: compared to the printed book, image and text quality seen here are greatly reduced due to internet bandwidth limitations. "...this is a tour de force, a tremendous achievement in bringing this extraordinary kingdom to life... With its originality, freshness of approach and liveliness of text, I would like to think that Fascinated by Fungi will become a classic text, introducing a new generation to the wonders of fungi." James Robertson, review in Natur Cymru. Whether you are a beginner, an experienced fungus forayer, or a practising field mycologist, you will love this beautiful book. 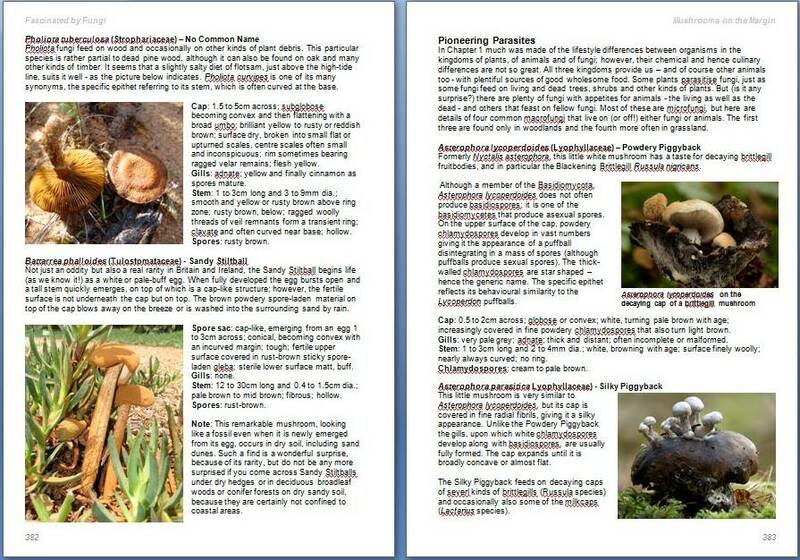 It is written in jargon-free plain English and a lively and highly readable style by one of our most entertaining and perceptive writers on wildlife and countryside matters. Softback laminated, 450 pages all in full colour; more than 1000 colour photographs. Great value at RRP £25 plus P&P. 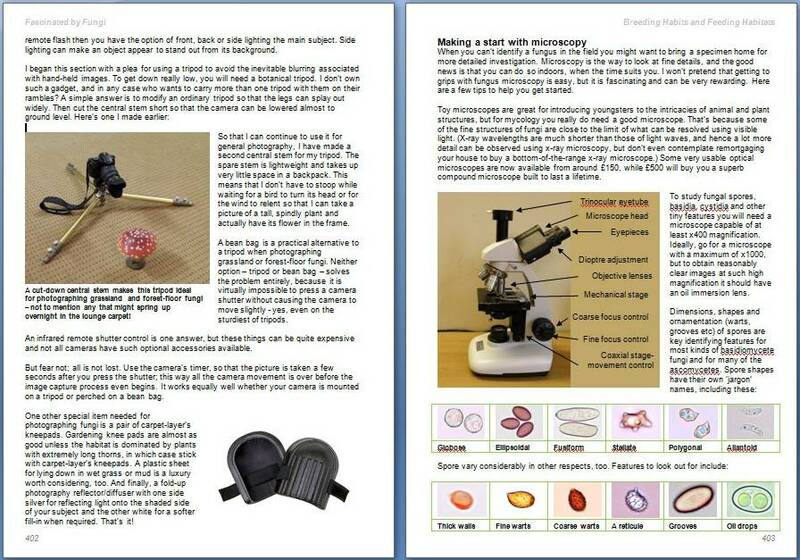 "An absolute must for anyone interested in this fascinating subject. I rate this superb book at 10 out of 10." Martin James, BBC Wildlife and Countryside Correspondent. 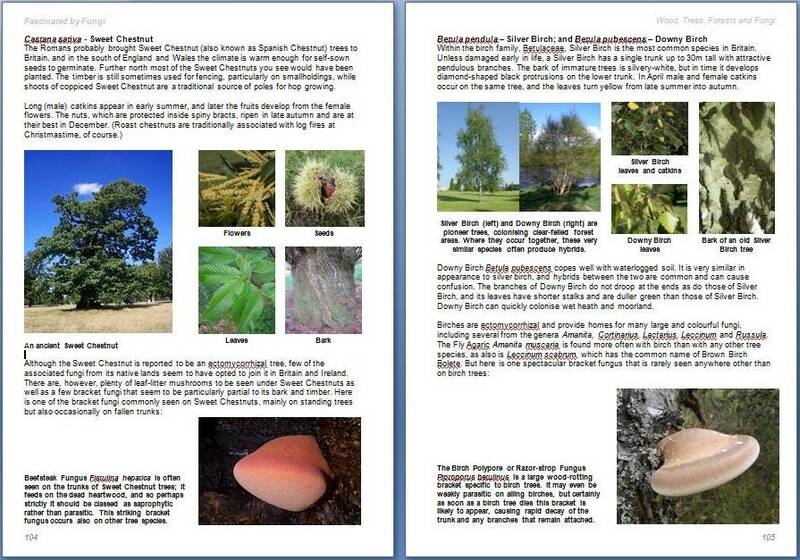 Many books about fungi are field guides with just the essential information to aid identification. 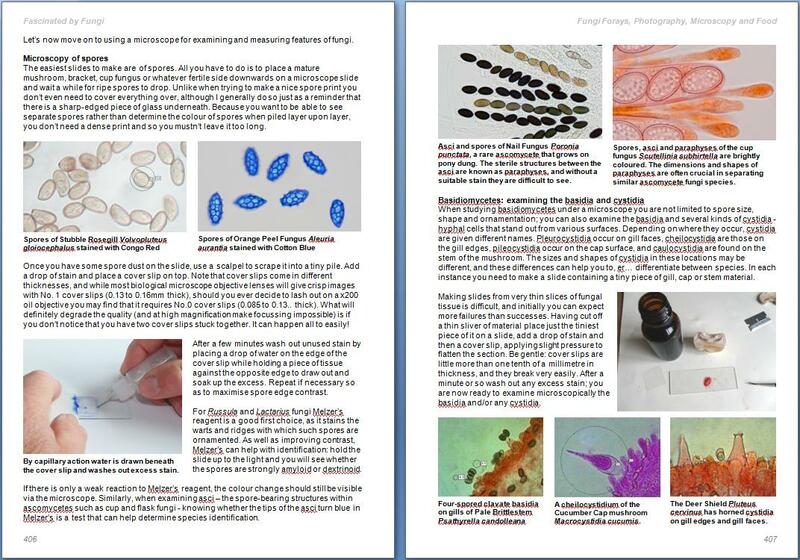 Fascinated by Fungi is different. 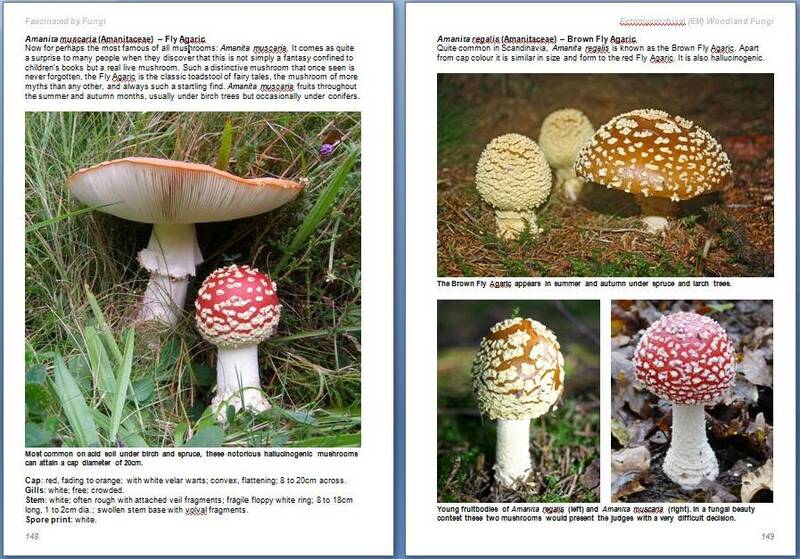 While it does contain details of identifying features for more than 400 mushrooms, toadstools, brackets, puffballs and other kinds of fungi, what you also get are fascinating facts such as historic uses, infamous poisoning cases, uses in food, medicines including antibiotics, and country-craft processes plus illustrated guides to fungi photography and the selection, setting up and use of microscopes to help in identifying fungi. 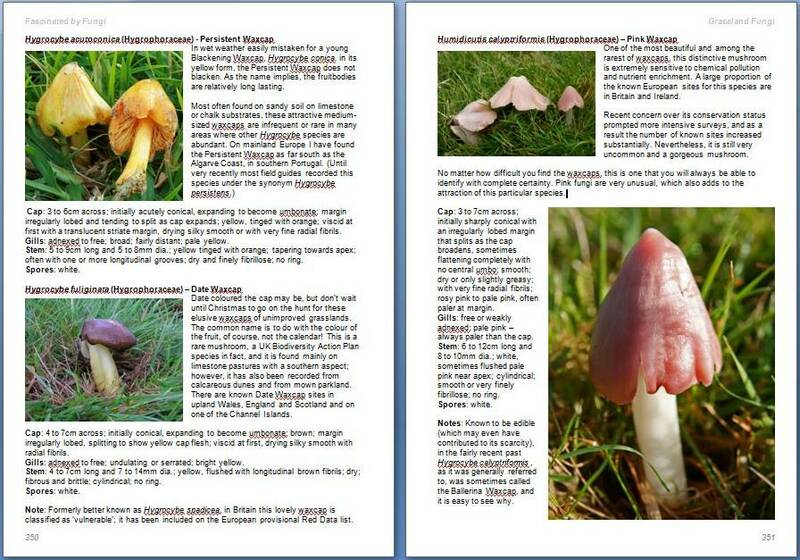 There is advice on producing mushroom meals - field and forest food for free - with menus, preparation and cooking details, and pictures of the final meals. 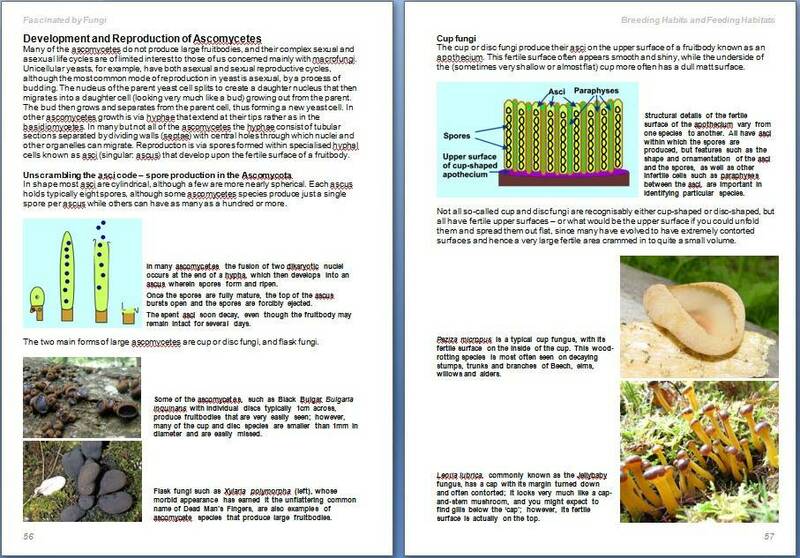 And if the biology of fungi interests you, there is a large chapter covering the structure, nature, growth, reproduction and habitat needs of basidiomycetes, ascomycetes and lichens. Unique features of Fascinated by Fungi that book reviewers have highlighted are the liveliness and readability of its entertaining and informative text; the author's tremendous enthusiasm that shines out from every page; and the wealth of superb pictures and clear diagrams - more than 1000 colour images of specimens at their very best and photographed in their natural habitats plus close-up pictures of gills, pores and other key identifying features. This is a big book, with a great deal packed into it that you will not find in any other book about fungi. 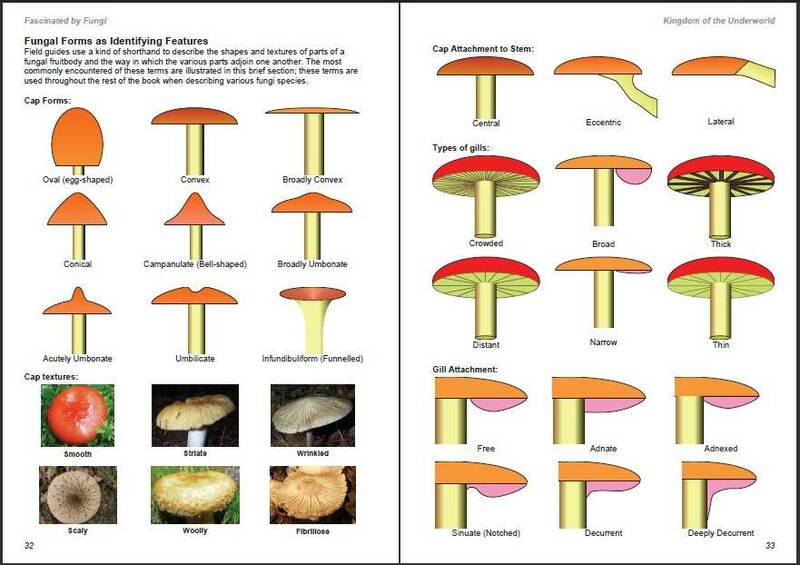 So many fungi books are much the same as one another; this book on fungi is very different; it stands out from the crowd. One eminent mycologist has already described it as '...the best book on fungi produced in recent times'. Certainly the reviews support the view that Fascinated by Fungi is unique and destined to become a classic. Pat, an active conservationist, has chaired and served on several advisory committees and special commissions. 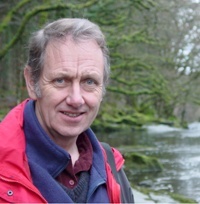 Until April 2013 he was a member of the Council of CCW (the Countryside Council for Wales, now Natural Resources Wales), making good use of his special interest and expertise in fungi conservation (he is a Member of the British Mycological Society) and the management of National Nature Reserves in Wales.